Driving around in this variable weather gave me the opportunity to analyze how clouds really look. A lightbulb went off in my head as I realized that one can’t see the characteristic fluffy top of a cloud when it hovers overhead. I also noticed that, when the sky is filled with cumulus clouds (cumulus himilus, according to the lovely book, Clouds, by Eric M Wilcox, my friends Claire & John gave me), they seem to sit on a ceiling platform, and follow the rules of perspective, though it is admittedly difficult to “keep your place” when drawing them. I love the in front/behind effects too, where a whitish cloud sits in front of a dark grey bank, or vice versa. 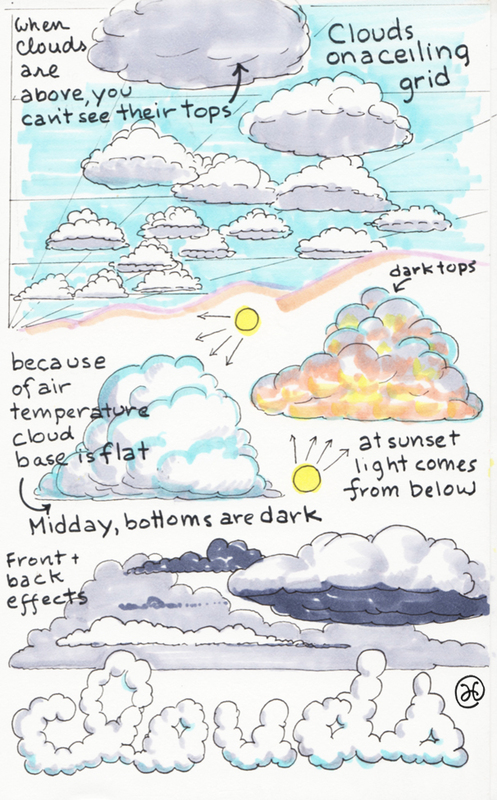 Cumulus clouds come in a range—himilus=fair weather; mediocris(seriously! )=more significant height; and the cumulonimbus storm clouds, which often turn into a cumulus congestus complex, a familiar site these days of unexpected winter storms.